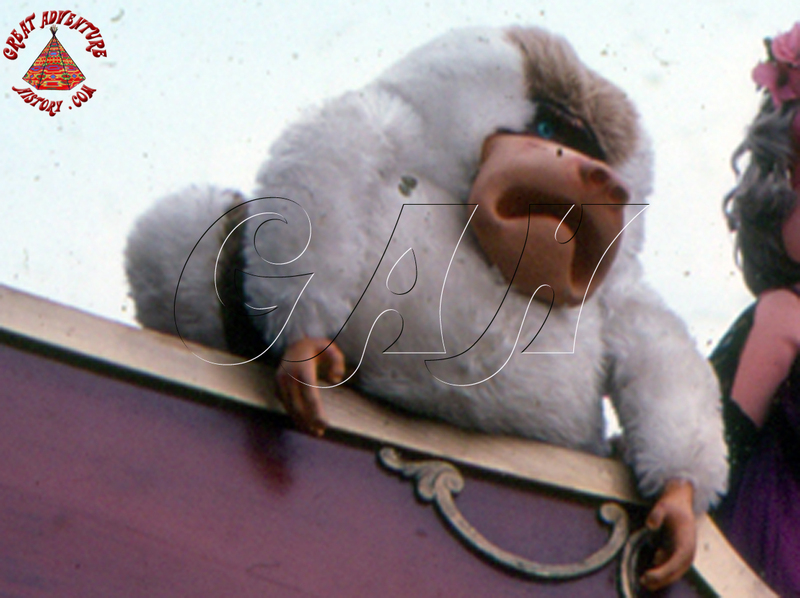 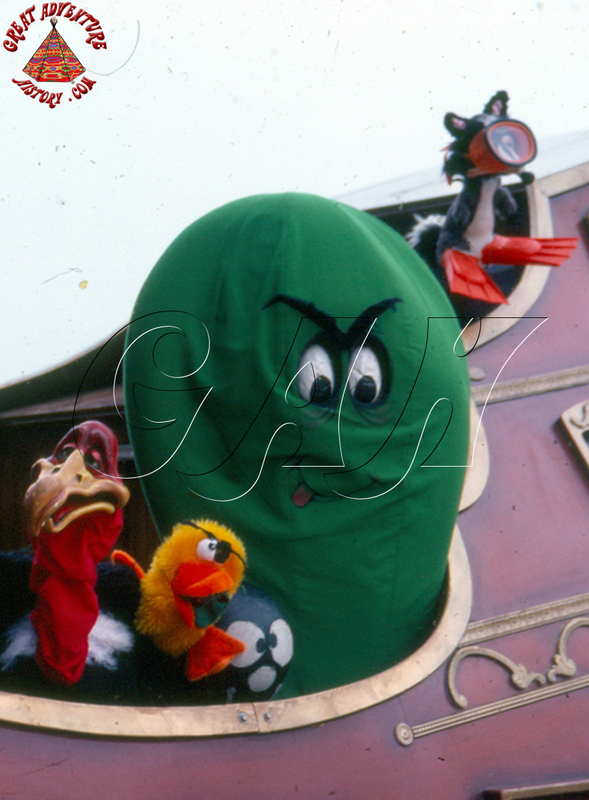 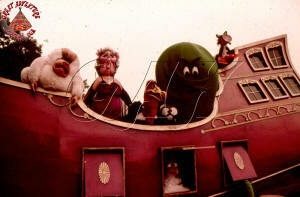 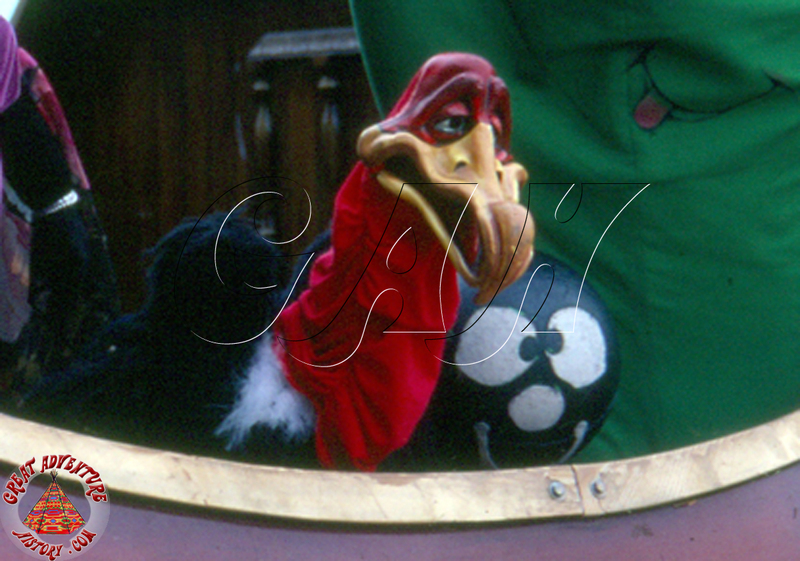 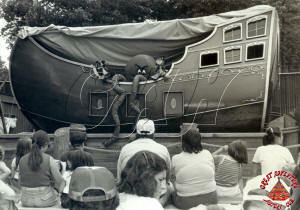 Puppet shows have long been part of the entertainment offerings at fairs, amusement parks and then theme parks. 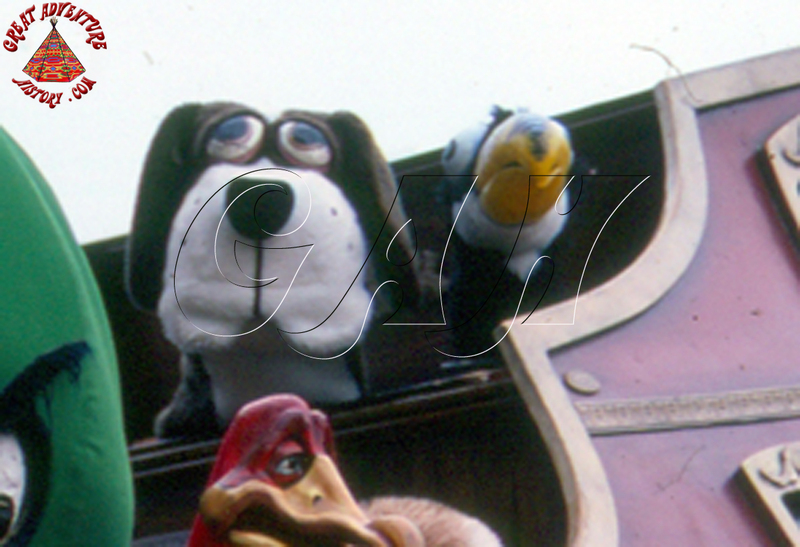 Some of the earliest records of fairs included traditional "Punch and Judy" type puppet shows. 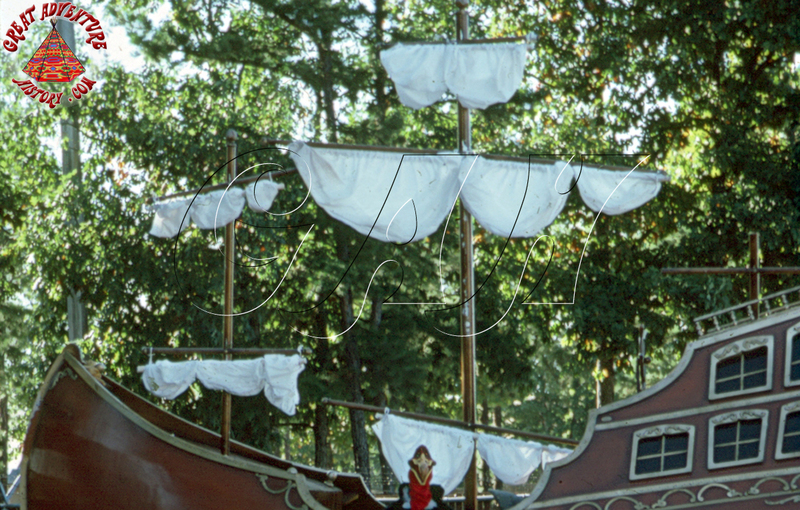 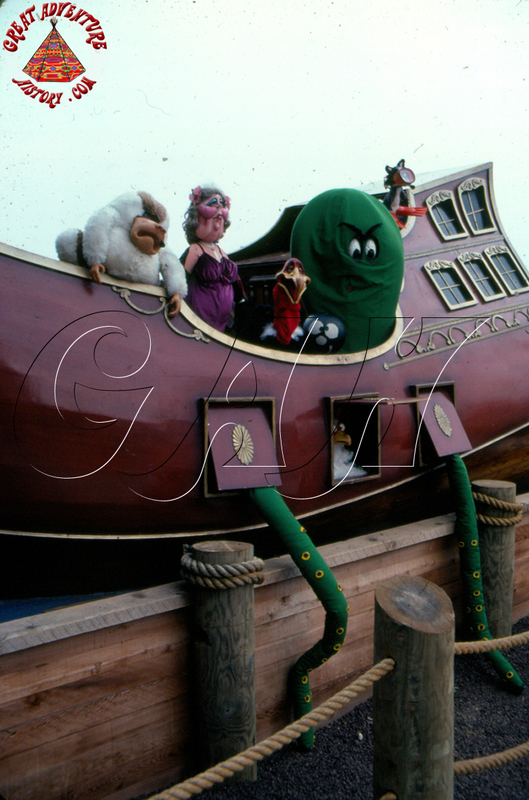 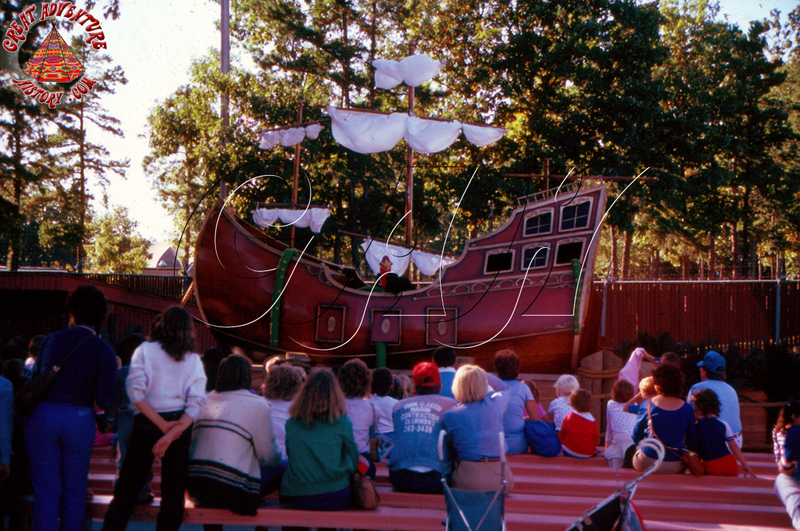 Located at the rear of the Kiddie Kingdom area of Great Adventure, the Foghorn Follies puppet theater was a really unique structure designed to look like a big ship. 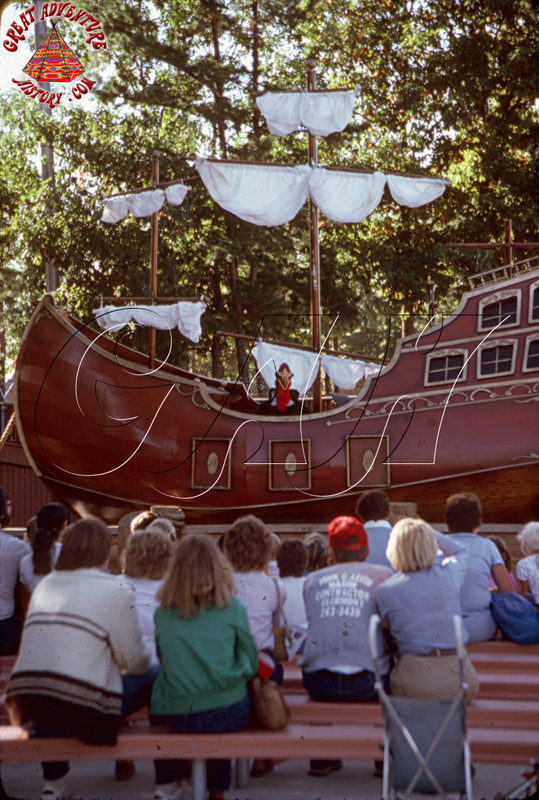 The structure was located in the sandbox play area and was setup with benches for guests to sit and watch the show. The ship structure offered multiple levels for the unique puppets to appear and perform their comedy show. 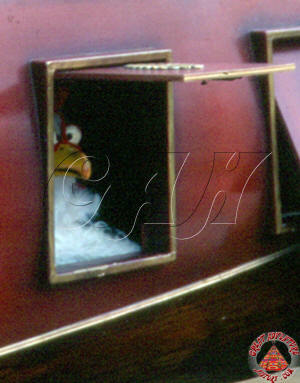 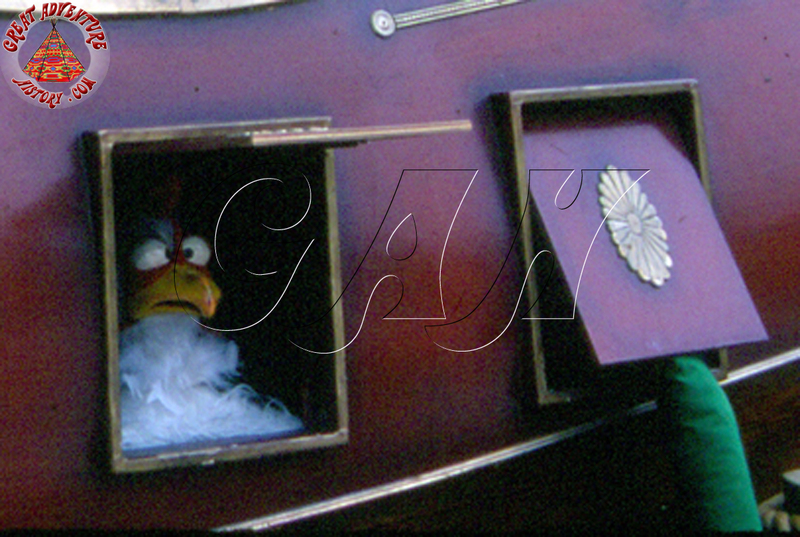 The unique menagerie appeared both "on deck" as well as through the cannon holes on the side of the ship. 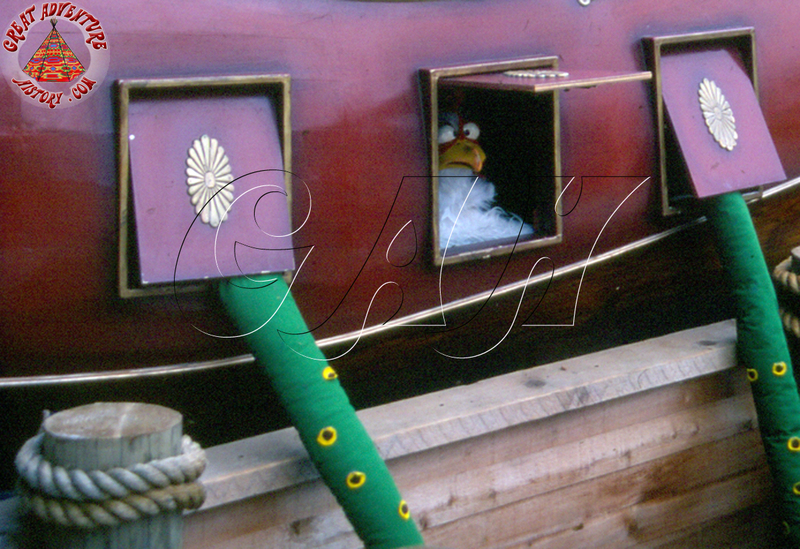 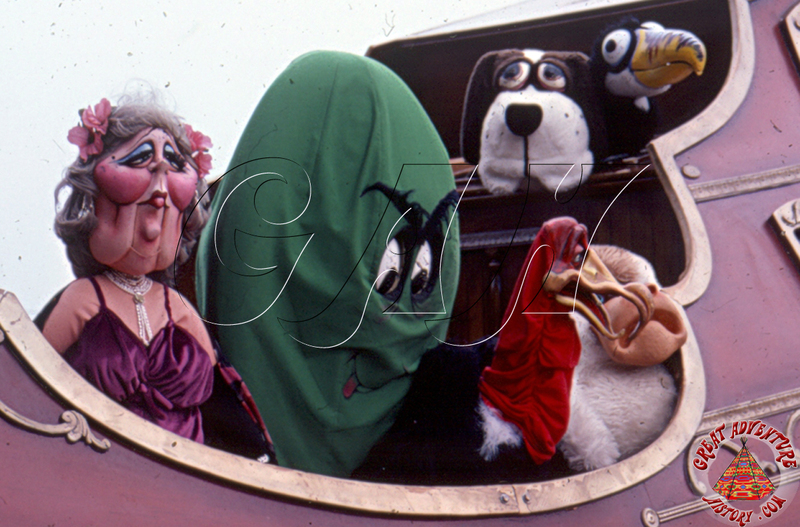 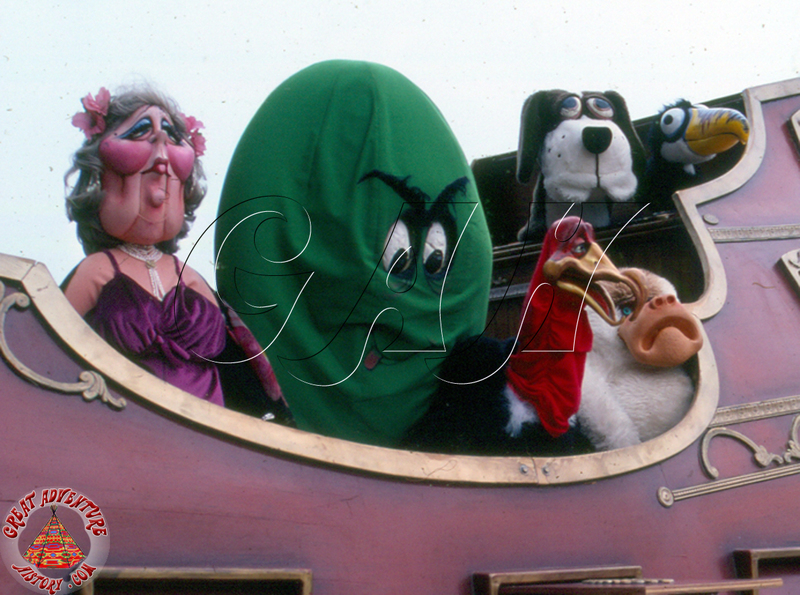 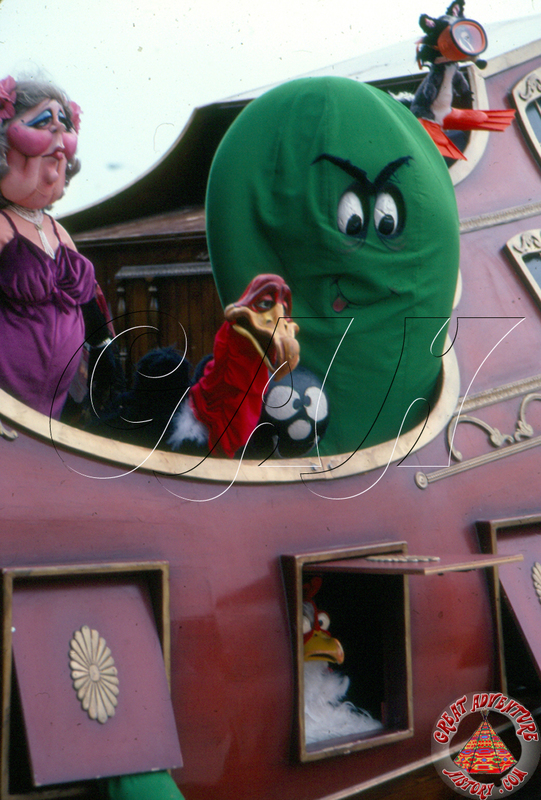 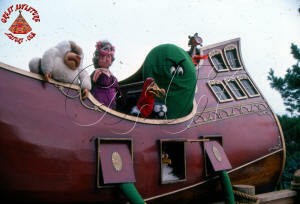 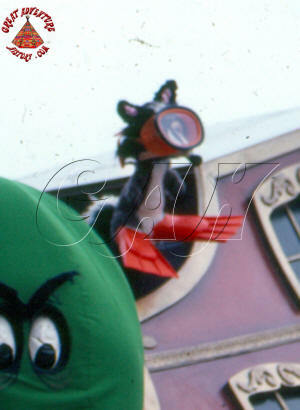 Perhaps the most notable of the puppets was a giant green octopus whose tentacles emerged through two of the cannon ports. 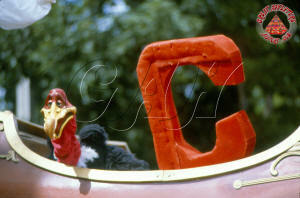 The puppet show was aimed at all ages, with really bad corny jokes and puns (like the buzzard singing "By the C"). 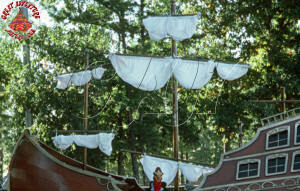 The ship was fitted with masts that could be removed and a tarp pulled over the top to protect it from the weather. Given the popularity of the Perthy P. Pelican puppet show at the opposite end of the park, an expanded ship-shaped puppet theater seemed like a natural idea. 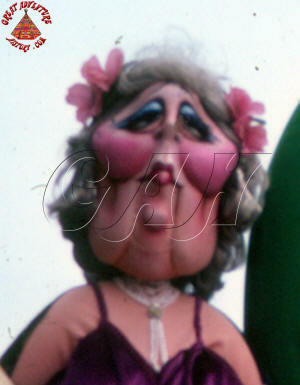 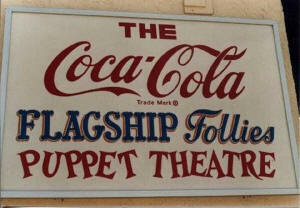 However, the puppet theater suffered in viewership simply because of its poor choice of location. 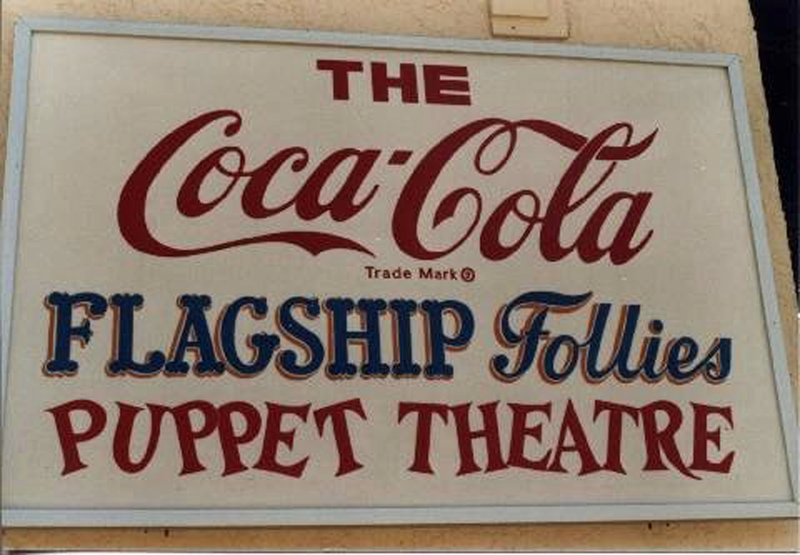 It was positioned right next to the Pet-a-Pet petting zoo which tended to provide less than desirable aromas during the heat of the summer days which tended to scare off audiences. 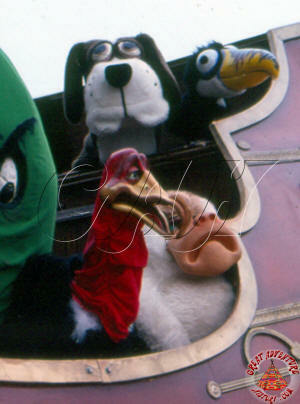 The Foghorn Follies were short lived, lasting only two seasons at Great Adventure. 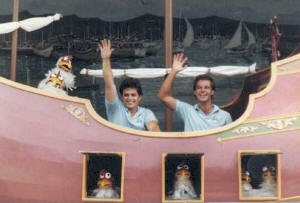 The theater and the show were moved by Six Flags to their brand new Atlantis Waterpark in Hollywood Florida. 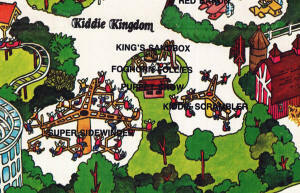 Six Flags had opened Six Flags Atlantis waterpark in 1983 and looked to develop it beyond being just a waterpark by adding shows, games and eventually rides. 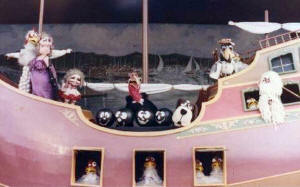 The Foghorn Follies theater and show made the journey south from Great Adventure where it became the "Flagship Follies". It would later be joined at Atlantis by Great Adventure's Matterhorn ride in 1987.